A great deal of the Leave argument centres on the claim that the UK would be a big player still outside the EU. But would it? 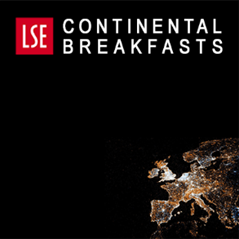 Dennis Leech uses voting power analysis to explore how the UK standing alone is likely to rank in the world – and the conclusions are pessimistic. On reasonable assumptions, the UK would be outside the top ten players in world terms. Can the UK become more politically powerful by leaving the EU, thereby regaining the full status of a sovereign state – rather than remaining a member of a large and powerful EU voting bloc? A political actor may well have more influence by being a member of a powerful group than it has acting alone outside it. It gives up its power over decisions taken within the group in order to gain power indirectly from the greater power of the group: in other words it benefits from the power of combined forces. The UK’s prospects inside and outside the EU essentially raise empirical questions about ‘weighted voting’ – where your power is related to the size of the unit and your share of influence over its policy-making (for more on the methods here, see the end of this blog for tech details of how weighted voting can be analysed). The EU has a defined voting procedure with precise rules for internal decisions, so we know the UK’s weighted voting power here exactly. Unfortunately there is no analogous world voting body where we have this metric. However, we can paint some realistic scenarios. In a world body which uses a voting rule of one-country-one-vote, we can say there is no reason why the UK would not be better off out. Here we might think of the EU as having just one vote, as would every other country outside the EU. This idea might be applied to international bodies such as the World Trade Organisation. The UK might improve its position acting alone because then it would get a seat on the WTO. Another example might be the United Nations General Assembly which uses unweighted voting (in other words one-country-one-vote) but where the EU cannot be a member. Far more commonly, however, a country’s influence is likely to depend on its size, with its ‘voting power’ being greater the larger it is – a pattern that is crystal clear in the EU’s internal operations. Here the UK is one of the big four member states, and has vastly more influence on the EU’s decisions than (say) the minnow states like Malta or Cyprus. Suppose we consider a generic world body of which the EU is a member, along with all other stand-alone countries in the UN. 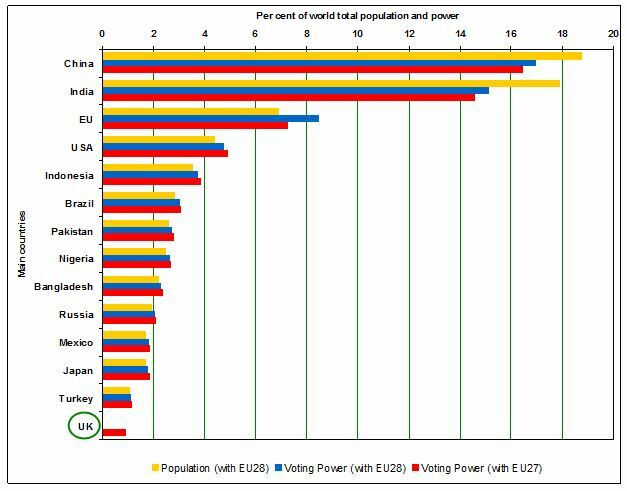 Let’s assume that the EU’s and the individual countries’ voting weights are all set proportional to their populations. In such a body the most powerful members would be China and India with the EU in third place and the USA in fourth, followed by a list of mainly developing countries. Although this is just hypothetical, it is useful in providing a way to get a perspective on the structural effects of Brexit. Some information is better than none, and so an approximate answer to a general question is better than nothing. A first thing to consider is how the UK’s standing in the world would change compared to that of its major EU neighbours in the event of a Brexit vote. Table 1 shows what would happen in our hypothetical world body. Surprisingly the impact would be that Germany, France, Italy, Spain and Poland would all benefit appreciably from a UK exit. Each of these these ‘big six’ EU nations would be substantial gainers because they would be more dominant within the EU, and thus get a bigger share of the EU’s still very substantial world power. Meanwhile the UK would lose ‘world power’ by leaving, dropping from the third most influential of the big six European countries to fifth, with a share of world power below that of Italy and Spain. A second thing to consider is how the UK standing alone will compare in world power terms with all other countries before and after a decision to leave the EU. Chart 1 shows the results and they are not encouraging for any decision to leave. The UK standing alone would move dramatically out of the third-placed world power actor, to take up an incongruously diminished position as the 14th ranked country in the world, just below Turkey. On this basis a post-exit Britain would have around 1 per cent of world power – equivalent to the salience of Malta or Cyprus within the EU now. Not only that, but Britain’s exit would not much impair the overall power of the EU. Its share of world population would drop a bit (not shown in Chart 1), and so its power share would also fall. But in a more fragmented world the EU would still be more powerful than its share of world population would suggest. Meanwhile some other countries ranked just below the EU would benefit from the UK’s exit, as their share of world power increases – notably the USA, Indonesia and Brazil (interestingly neither China nor India gain, because of the way that power calculations are made in voting power analyses). This indicative analysis suggest strongly that the UK would lose voting power if it left the EU. One of the clearest effects would be to increase the voting power of the other five larger member countries within the EU’s decision-making, potentially making it easier for them to advance their interests relative to the UK. In the world at large, the UK standing alone would also be very far from the weighty actor portrayed in the Leave campaign’s discourse. 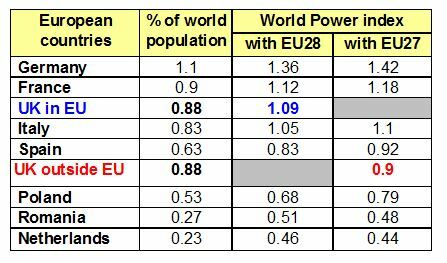 If world power is distributed on the basis of population shares, then the UK would no longer be part of the third-placed EU bloc pulling above its combined population weight. Instead it would be in a lowly-ranked 14th place, struggling to count as an independent actor in world affairs. 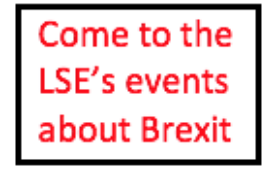 This post represents the views of the author and not those of the BrexitVote blog, nor the LSE. For Professor Leech’s full analysis paper, please see here. Image: CC BY 2.0. Dennis Leech is Emeritus Professor of Economics at the University of Warwick, and Visiting Professor in Government at the LSE. With his son Robert he authored the world’s leading open access site for voting power analysis. Like many Remain protagonists you think EU membership is only about economic matters. If only it was! 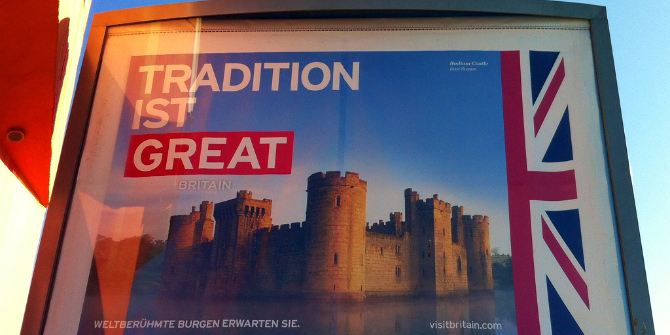 Then the UK would be its biggest enthusiast. We all understand the notion of the Common Market. But have you noticed that the EU is stripping away sovereign independence of the nations within? That is Sir, what concerns millions of British citizens that are not international traders or economists. You are now pushing on the wrong buttons. The EU prevents nations from making their own choices on who lives in their country! It prevents countries from choosing who it can evict and deport. Where is your graph for that? It prevents nations from deciding how to manage access to its social services – give us a graph. It prevents nations from challenging EU laws that are not in its interest. In fact there is no control over that. Us Brits are every bit European. We love the difference. We love the cultures. We love our holidays in Europe. But we don’t like being intimidated or threatened. We are making a decision for the very long term. So whilst noone loves change and uncertainty we will accept it for a better future for our children and their children. We’ve been a great nation and we’ve been an economic basket case. Whatever the economic disadvantages you may describe we’ll get through them. So startstart from there and give us your big picture life assessment. Thank you. Does your paper come from someone committed to the EU or from an impartial author? You see, if we know the answer to that we know how much weight to what is written, don`t we?